Official Ultimate Arms Gear New Generation Rechargeable LED 130 Lumens Tactical Flashlight With Strobe Feature & Integral (non removable) 7/8"" Weaver Picatinny Mount : Includes Rechargeable Li-Ion Battery, EU 220V Travel power adapter, and a high quality remote pressure sensor cord so you can control the on/off with just a little squeeze of the pressure pad. Also features a push button tail cap for your choice of application. The Flashlight measures 6"" Long, has a 1"" tube,and is constructed to be lightweight ( Only 8oz with battery ) and ultra strong & long lasting with aluminum T6 Housing. 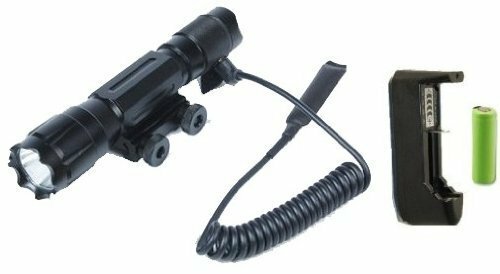 For premium tactical security the light is O-ring sealed , weatherproof, and waterproof and also has a front serrated bezel that works great as a weapon (on a rifle-shotgun). The integral 7/8"" weaver-picatinny mount utilizes 1.75"" of rail space and features easy quick attach/detach thumbnuts. Widely used by military, police forces, and SWAT teams. Works with all weapons: rifle, shotgun, paintball, airsoft & pistols with a weaver-picatinny rail." Aircraft Grade Aluminum T6 Housing - O-Ring Sealed, Waterproof & Weatherproof! Travel Adapter Included So this great light can also be used in Germany, Austria, Italy, the Netherlands, Belgium, France, Spain, Portugal, Denmark, Norway, Sweden, Finland, Greece, Turkey, Israel, Poland, the Czech Republic, Slovakia, Hungary, Rumania, Bulgaria, Russia, Middle East, most of Africa, South American and many developing nations.